We arrived at Hardy Farm in Fryeburg, Maine surrounded by the White Mountains excited to see Karina & Dustin. 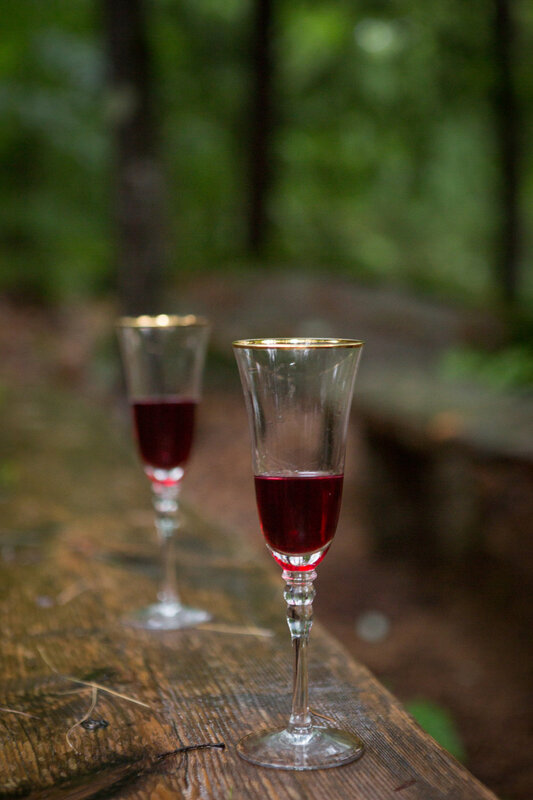 The humidity & dark clouds were settling in as we approached the farmhouse to greet Karina. Her mom lead the way to where she was in the process of getting ready. She was laughing with her Maid of Honor, Whitney and Junior Bridesmaid, Emma. All the girls wore beautiful & colorful floral robes. They were speaking fast and excitedly about the ceremony and what the day would bring! Whitney left her best friend’s side to go find Dustin’s gift- and what a tear jerker this was! Karina was beyond excited to open it and quickly tore the wrapping paper off. Her eyes glistened as she snapped the jewelry box open. 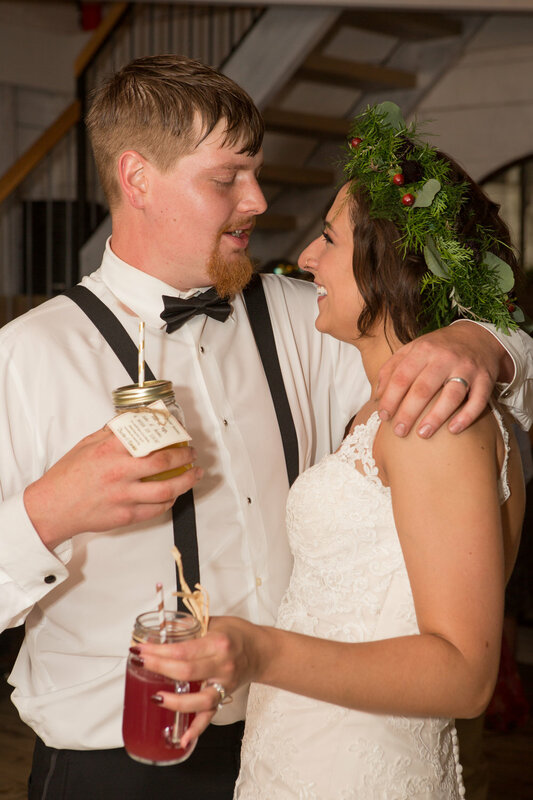 Dustin had gifted her a beautiful pear shaped necklace in rose gold--perfect for a bride. She was eager to wear it with her gown... “It’s beautiful,” she breathed. Whitney then handed Karina another bag--this time it was her gift to the bride. Karina pulled a small wooden crate out of the bag and immediately began to tear up. The crate was stuffed with letters. She opened Whitney’s letter first and it brought her to tears with so much love and emotion. Her mom’s letter was next, also making her cry. The ladies were emotional with all their love for one another and support for Karina on her special day. As Emma and Whitney got their head wreaths trimmed, Karina opened a letter from Dustin. As she read the letter the entire room felt the warmth and comfort the bride was feeling as she read the words from her best friend and soon to be husband. It was clear how in love and ready she was to marry Dustin. Everyone started to get into their dresses as the clocked ticked closer to two o’clock. 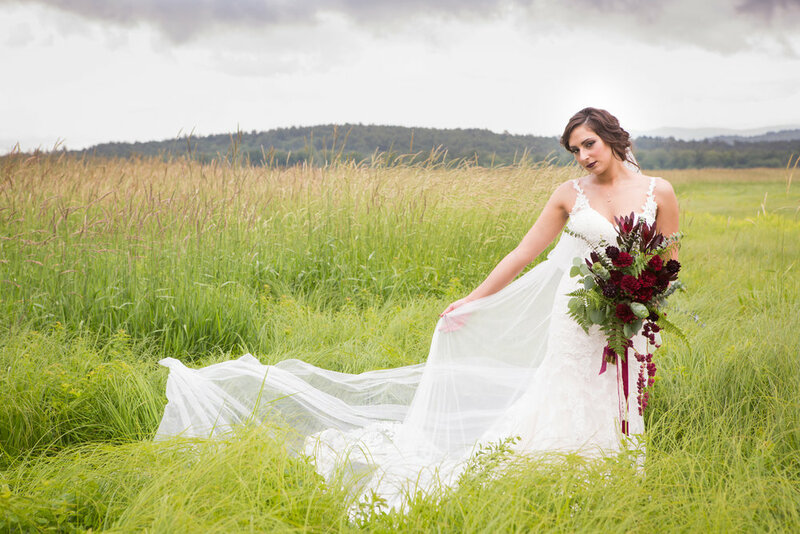 With the help of her mother, Whitney and Emma -Karina slid into her gorgeous white lace gown. 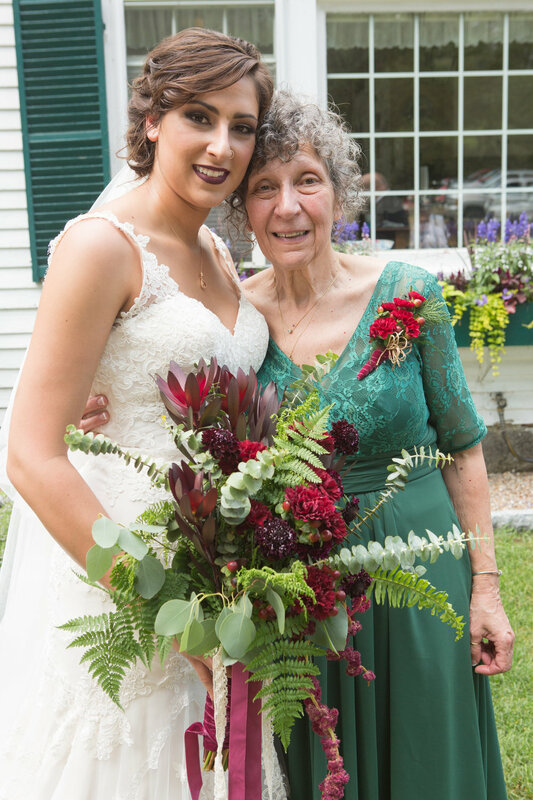 Her makeup was incredible and her veil long and regal. 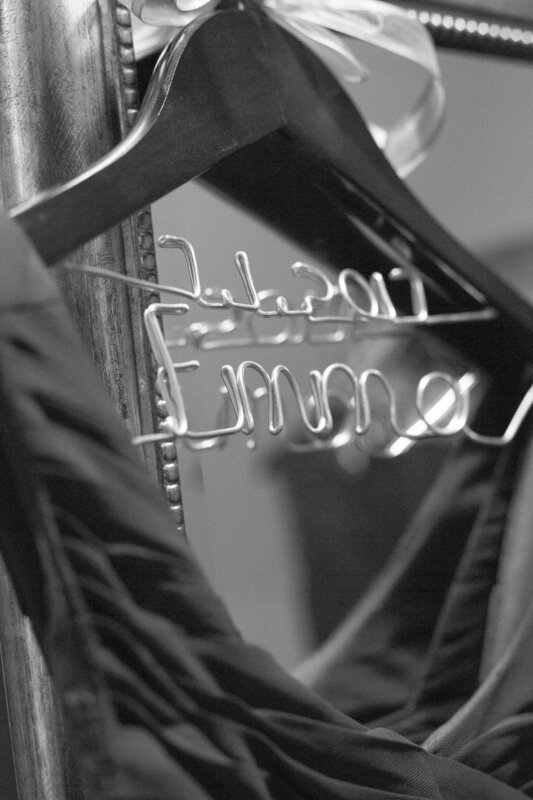 She was ready to become Mrs. Emery. We were all in awe by the way Karina wore her gown and stood with such beautiful grace in front of the mirror as she wiped away happy tears. 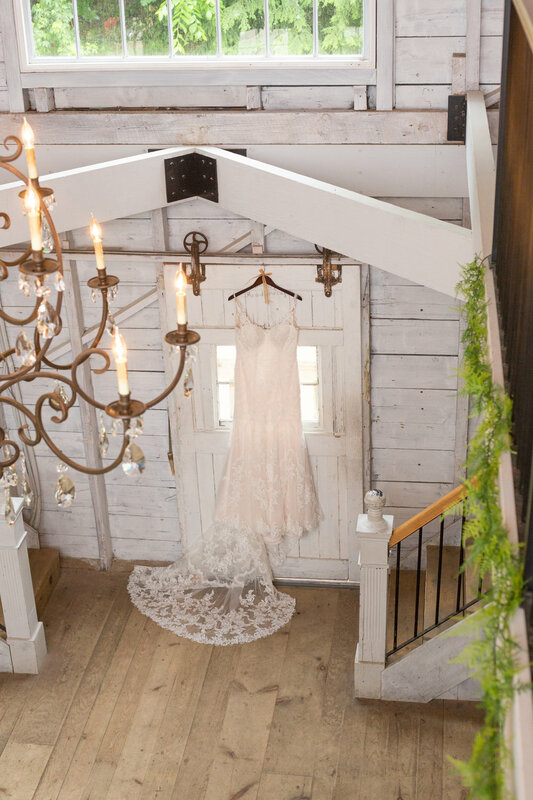 We took some time to photograph the rings, dresses, jewelry & flowers inside the barn. 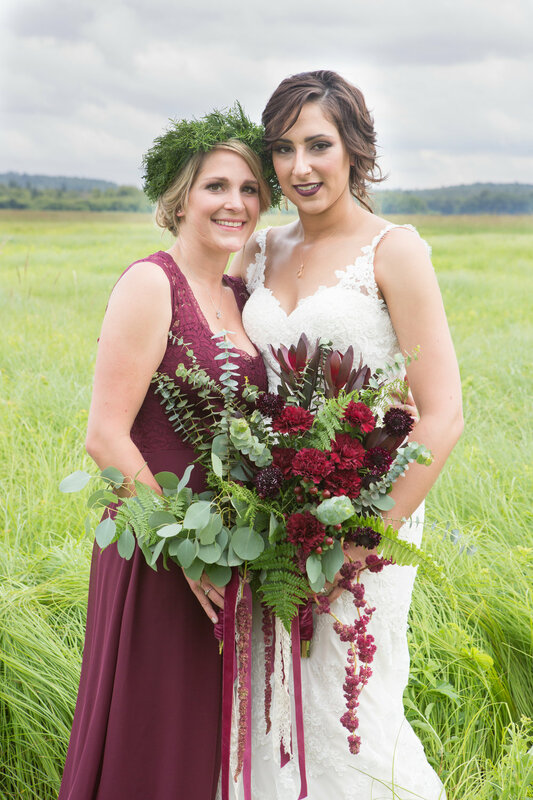 As we hung the gown and perfectly placed the flowers we couldn’t help but chat about how the barn was decorated! There was a popcorn and candy bar- how neat! We were mesmerized by the beautiful chandeliers and greenery to tie in the theme of Karina & Dustin’s big day! 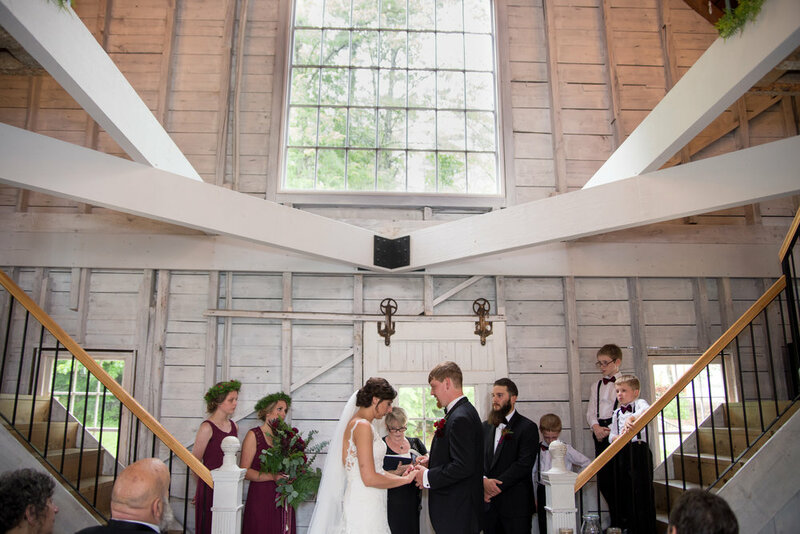 We were IN LOVE with this entire venue and hope we can get back to Hardy Farm soon! Meanwhile Dustin was getting ready for his big day alongside his mom & dad down the road in a nearby log cabin. Karina gifted a gold chain necklace to her groom as a gift to say I love you on the big day. The necklace was to replace the old one he once had. Dustin was also given letters from his family & bride. We thought it was such a creative and thoughtful idea that so many letters were exchanged that day. Dustin's mom was there to help Dustin button up and place the final touches on his look, while his dad was there to give love and support. It was very clear this was a tight-knit family and we adored being a part of these moments. 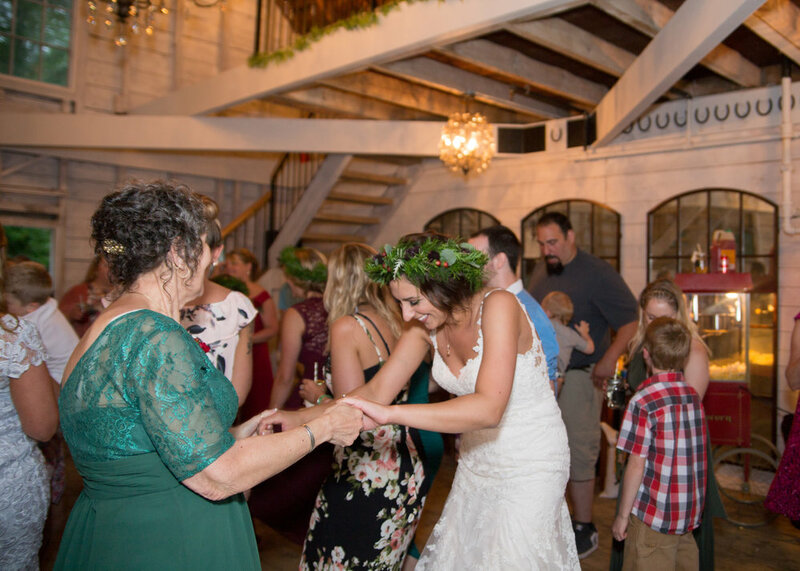 Due to the heavy rain, the ceremony was moved from outside to the barn- where guests were impressed by the decor and beautiful chandeliers that hung above where Dustin & Karina said their I do’s. 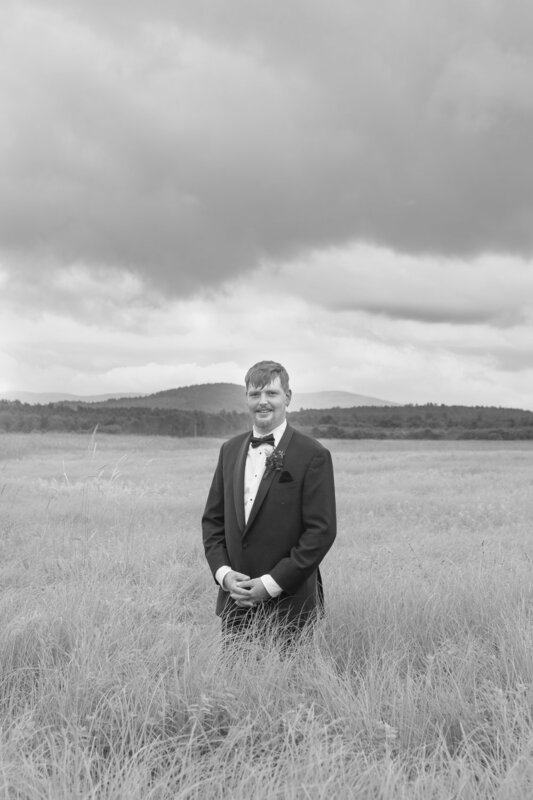 Once all the guests were seated and the parents were escorted in, Dustin, Christian and the groomsmen lined up. Whitney and Emma made their way down the aisle. 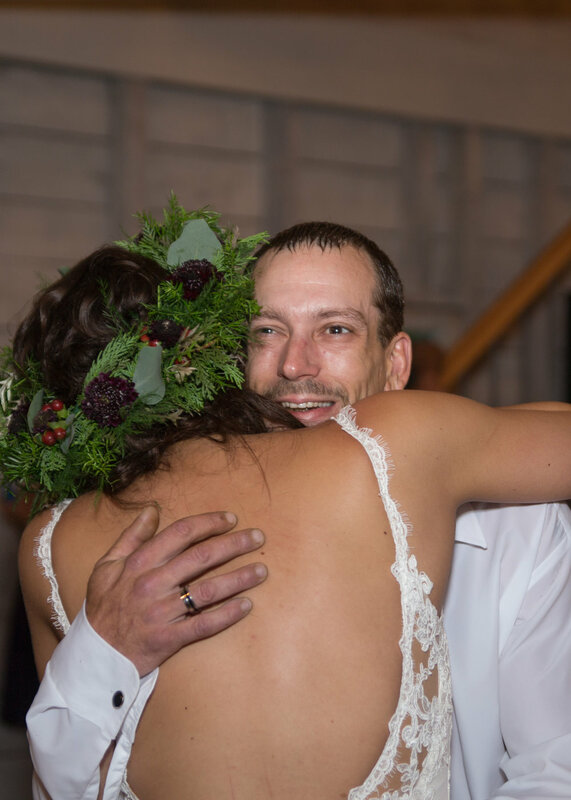 The song changed to the instrumental version of “A Thousand Years” and Karina and her father entered the barn and began their walk towards Dustin. 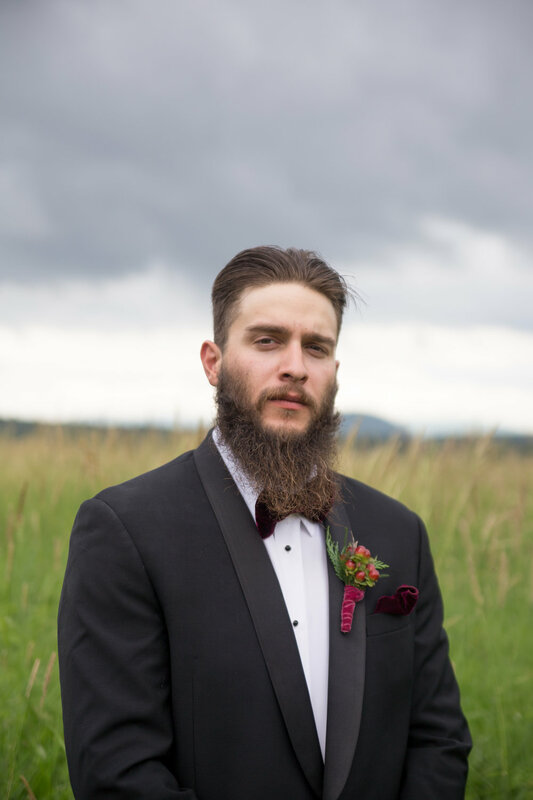 When Dustin laid eyes on his bride he was moved to tears. In the many years we have been in the wedding business never have we seen a groom react the way Dustin did when he saw Karina. He had been waiting for this moment for a very long time and clearly Karina took his breath away. Once they were reunited with each other Karina wiped away Dustin’s tears and reassuringly squeezed his hands. They recited their vows to one another. Dustin promised to take care of Karina, encourage and inspire her and to always love the crazy girl he fell in love with. Karina said, “Dustin, you are my world in more ways than you’ll ever know. You are my everything.” Following their vows, they exchanged rings with “promising all of my love, you shall never walk alone.” As they slid their rings onto one another’s fingers, they were brought to tears with the meaning; They were each other’s forever. 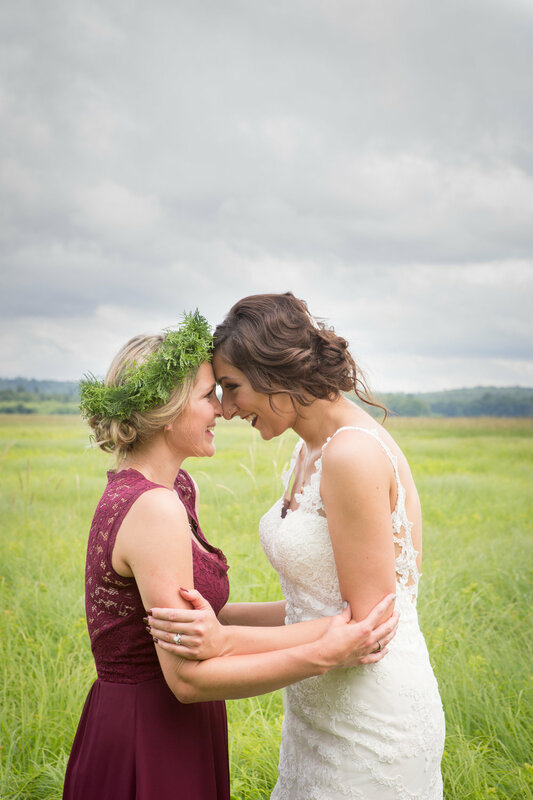 They sealed their marriage with a beautiful tear streaked kiss. They walked up the aisle and out the barn doors as Mr. and Mrs. Emery! The couple decided on a special moment to be had during the ceremony and that was the joining of sand to bind one another together forever- a special keepsake. Dustin and Karina both had jars of sand that they each poured into one jar to create something similar to their marriage as the grains of sand can never be separated. The couple and their wedding party stood outside the barn as they greeted each of their guests. Everyone was full of smiles as they hugged and congratulated the newlyweds! A few sunrays filtered through the clouds just in time for photos. Once all the guests had been greeted and were sent off to the cocktail hour it was time for family photographs! Once everyone had been photographed, the bride and groom along with their wedding party headed out to one of the nearby fields for photos. 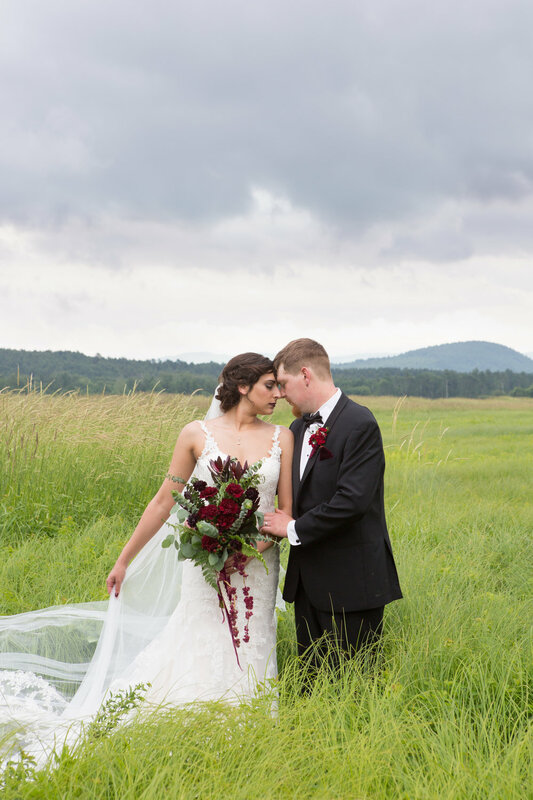 We were immediately in love with the location! The road was muddy and the grass tall, but everyone trampled through. Their shoes sinking into mud and dresses held in hands as they made their way out into the field. 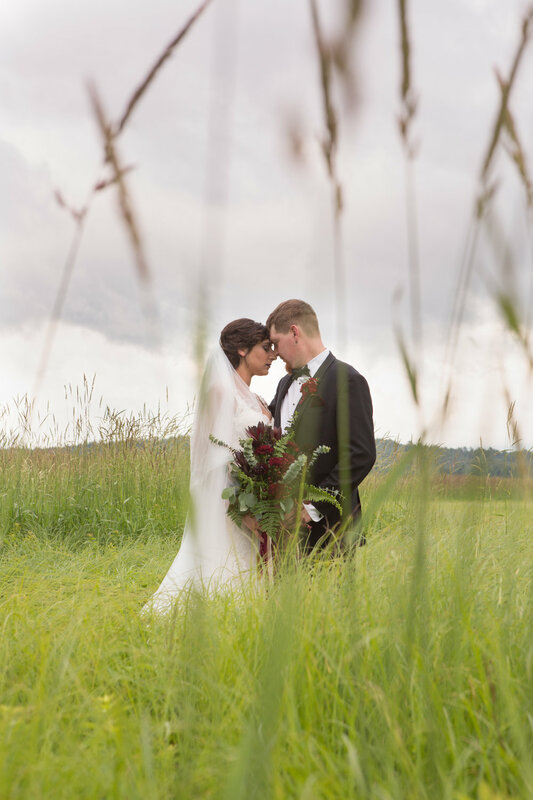 Dustin and Karina were so in love with one another it made for natural, beautiful photos. They had great chemistry with their wedding party which meant that the entire time they were laughing and cracking jokes. We had a blast with them & we couldn’t get over how gorgeous the dark clouds made for a perfect backdrop! The wind picked up, the sky darkened and everyone rushed to their cars just as it started to downpour. Dustin, Karina and their group made a pitstop in the barn before being announced into their reception. 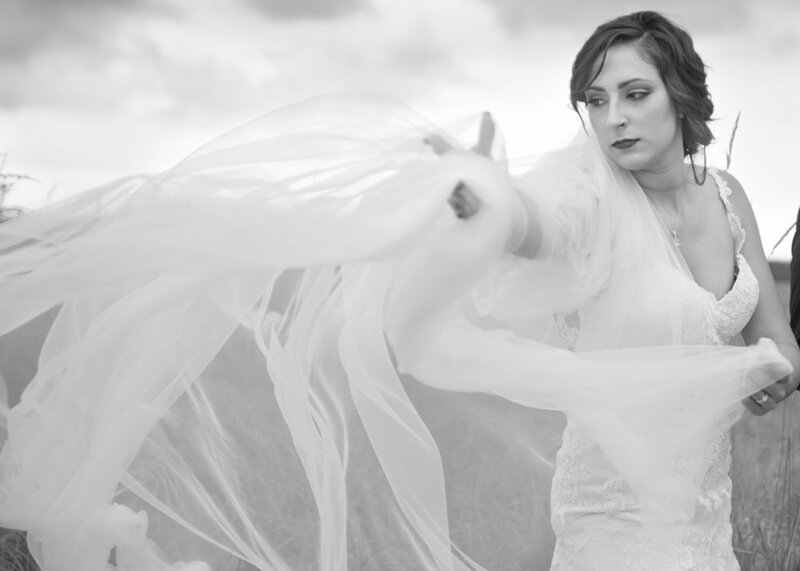 They dried off, bustled the dress and Karina exchanged her veil for a head wreath. 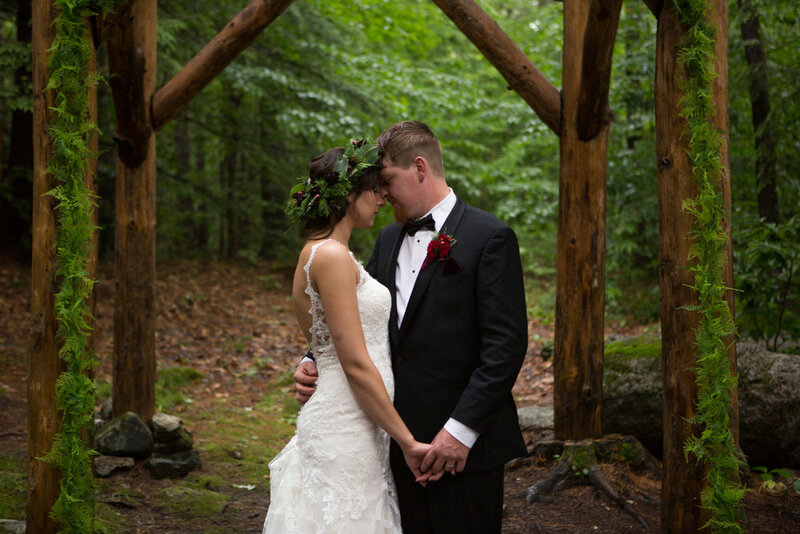 We LOVED the head wreaths- beautiful choice in colors! 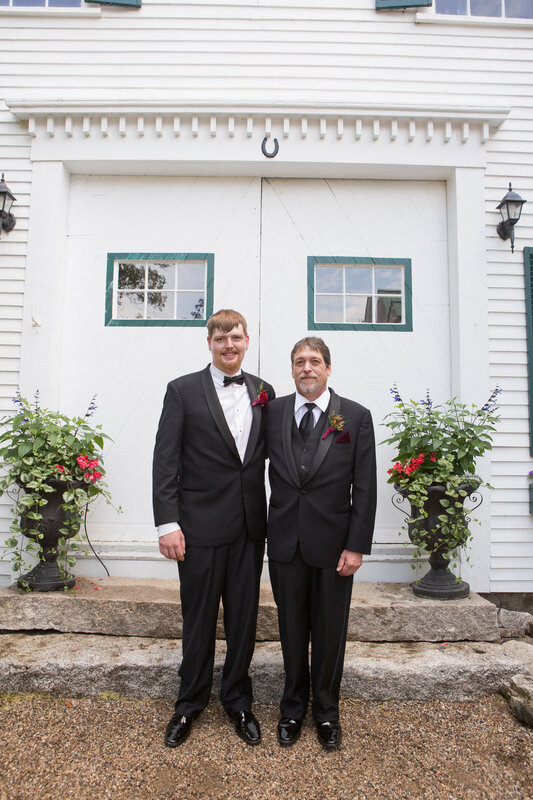 Armed with suit jackets and umbrellas, the group ran from the barn to the tent where they were announced into their wedding reception as the new Mr. and Mrs. Emery! The tent was beautifully decorated. It was straight out of a woodland faerie book. 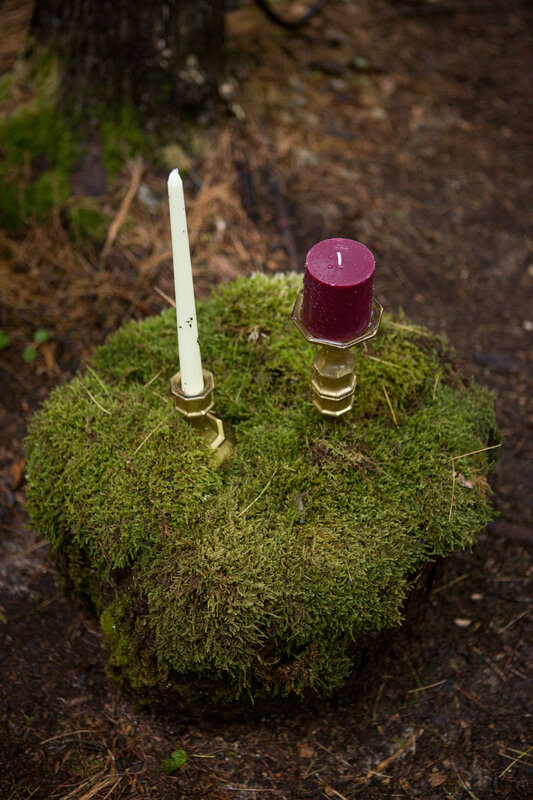 Each table had rich green centerpieces, burgundy napkins and gold accents. One of our most favorite decorated receptions yet! The head table had lush greenery adorning it. It looked magnificent with the bridal party’s head wreaths. It really brought everything together. Christian stood to give his best man speech, over thunder and pouring rain he thanked everyone for being there and appreciated the honor bestowed on being asked to be best man. He spoke of what a beautiful moment Karina and Dustin shared during the ceremony. Before Whitney gave her speech, there was a weather warning alerting everyone with a cellphone that there was a tornado warning for the area. Everyone headed down to the barn for the bridal shoe game to stay warm and safe (just in case!). Karina and Dustin sat in chairs back to back and slipped off their shoes. They laughed at their responses and enjoyed seeing what the other was saying. Once the rained slowed enough everyone headed back to the tent where dinner would be served. It was then time for the Maid of Honor to give her speech. She told a story of a time when they drove to the cape and they were talking about Karina’s future wedding. “Dustin is the definition of the man she always dreamed about.” She wished them to take time to enjoy each other and laugh together. However, she expressed that her greatest wish was that their love will deepen, and that they will look back on today as the day they loved each other least. She closed off her speech with, “Raise your glasses and get ready to shake your asses.” This brought the entire tent to cheers and laughter! 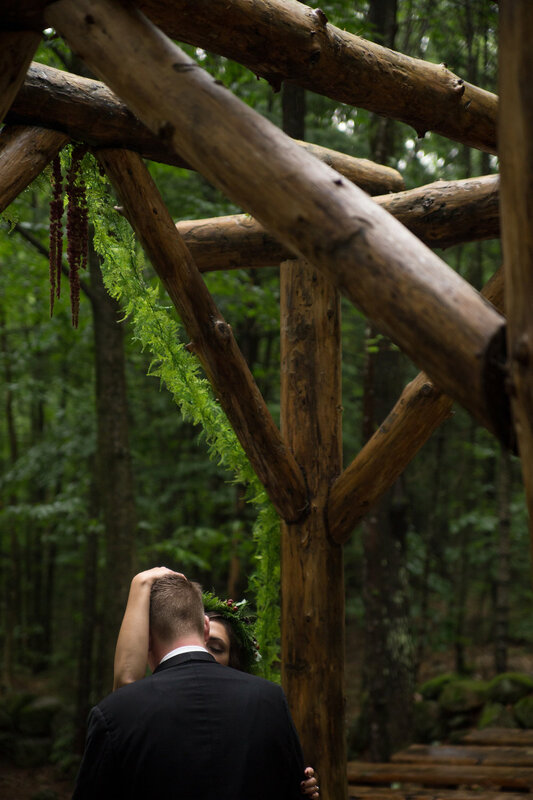 One of our most favorite pieces to the entire day was the few minutes we got to spend with Karina & Dustin alone in the middle of the woods under the arbor where the original ceremony location was. We could not believe the green & the way the light from the storm created warmth and perfect darkness for intimate images. It was as if this place was made for them. Some of our favorite photographs came from this 5 minute break with them. Thank you for sharing that time with us Karina & Dustin. Next, they made their way to the dance floor for their first dance. As Christina Perri’s “A Thousand Years” played the newlyweds clung to one another. They were in their own world, wrapped in each other’s arms as they swayed to the music. It was clear these two had a close connection- and as we looked around the room there was not a dry eye. They were so lost in each other as they danced smiling and laughing. Karina rested her head against Dustin’s for a moment as the song came to a close. 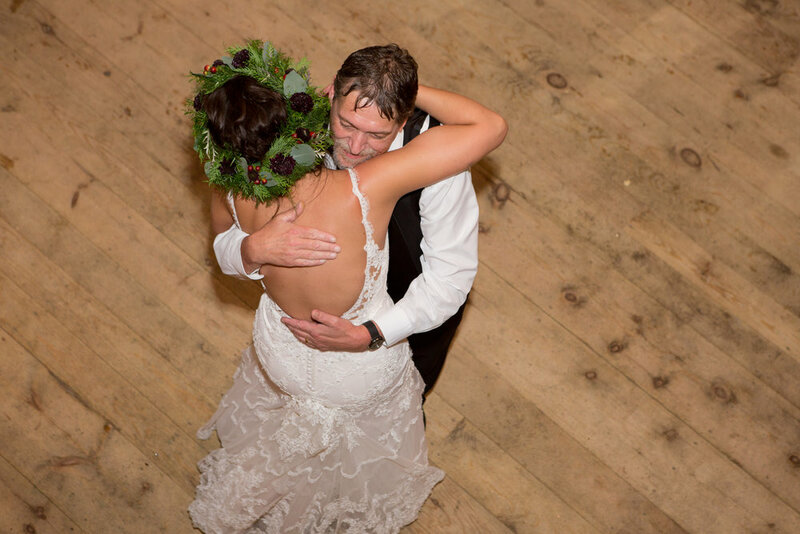 We see a lot of first dances- this one was memorable. Everyone looked on as though they too had waited years for this exact moment. Karina then shared a dance with her father to Tim McGraw’s “My Little Girl.” It was clear how elated he was to be sharing such a magical moment with his daughter. They kept laughing with each other and looking at one another as the song played. Dustin and his mom entered the dance floor next to Rascal Flatt’s “My Wish.” The duo swayed back and forth as they shared conversation. His mom’s eyes were filled with pride. 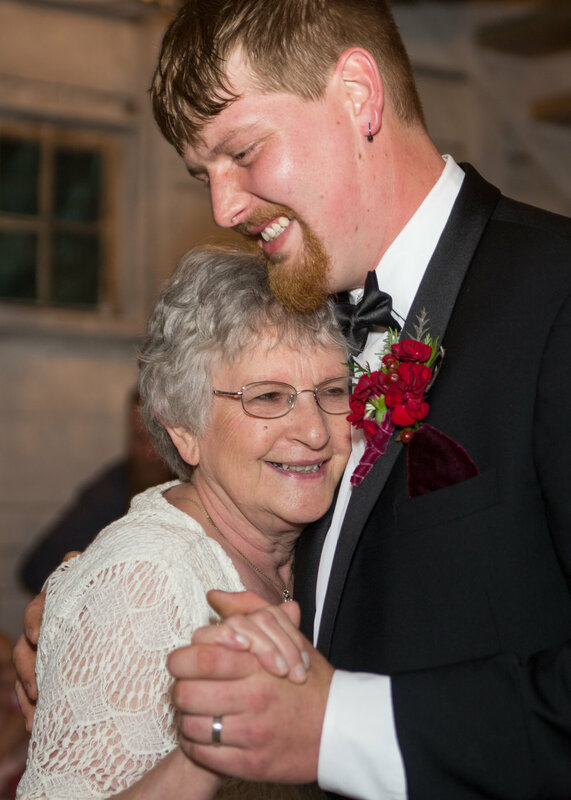 It was clear how happy she was for her son on his wedding day. She lovingly kept touching his cheek or fixing his shirt collar. After the special dances were finished, the party started. Karina, Dustin and their wedding party took the dance floor by storm! It made us want to put down our gear and join in! What a fun group- and the best dancing music! Everyone was having so much fun. Drinks were consumed, cake was eaten and the popcorn bar was a hit! Thank you for letting us join you on your wedding day. You two are magnificently in love and it shows in your moments together. 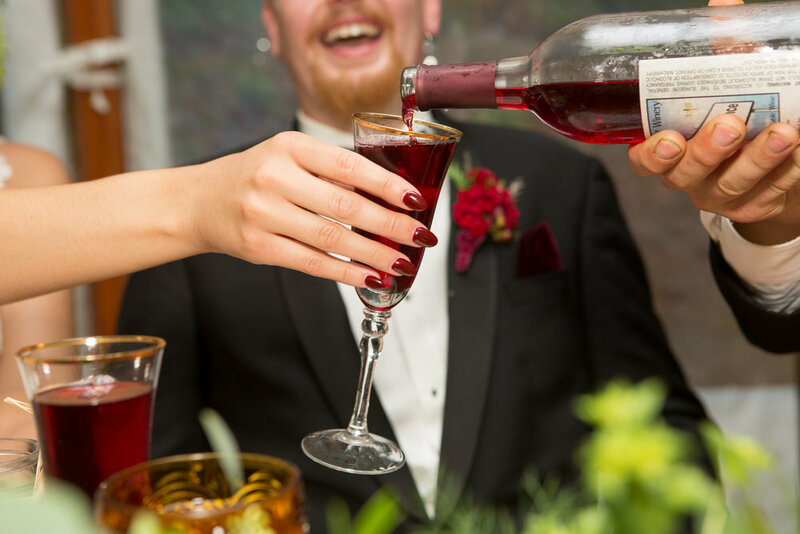 Audrey Hepburn said, “The best thing to hold onto in life is each other.” We have no doubt you’ll do just that. Congratulations!